Don't be fooled by the mason jars, homegrown veggie gardens and their affinity for all things modern vintage. With the eldest of the millennial set now in their early 30s, building careers, families and fashioning their adult lifestyles, they're more than willing to spend hard-earned cash on premium goods. But for a generation that's come of age in the the midst of economic disaster and a resurgence in green, eco-conscious values, quality doesn't necessarily equate to designer labels manufactured in faraway places. They want pieces, not things, that imbue true craftsmanship and the passion of its creator. (Bonus points for locally made, too.) Recognizing what she believes is a hugely underserved market, Elana Joelle Hendler, the savvy young entrepreneur behind EJH Brand candles and decor, set out to define eco luxury for a new generation. Starting with a line of hand-poured coconut wax candles made with 100 percent pure essential oils, Hendler developed fresh, sophisticated scents like Nectarine Mint, Wild Ginger, Apple Blossom and Cool Peony. Even the more traditional florals like Wild Rose and Lavender are refreshingly youthful, and all 10 of them are surprisingly gender neutral as evidenced by her sizable male demographic. 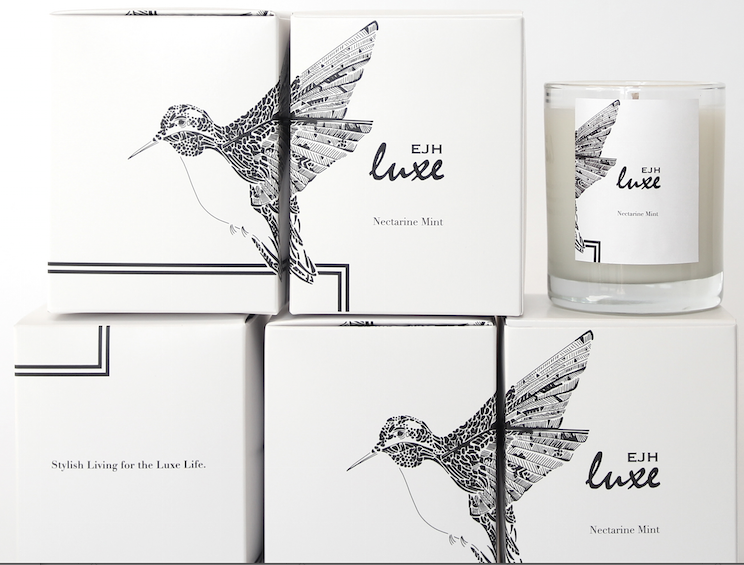 Each blend is unique, and each candle is finished with its own illustrated box and label – all depicting Hendler's original work of her favorite exotic animals and California wildlife. "One of my favorite traits of millennial entrepreneurs is the innate desire to infuse their passion and world views into their businesses," she writes. 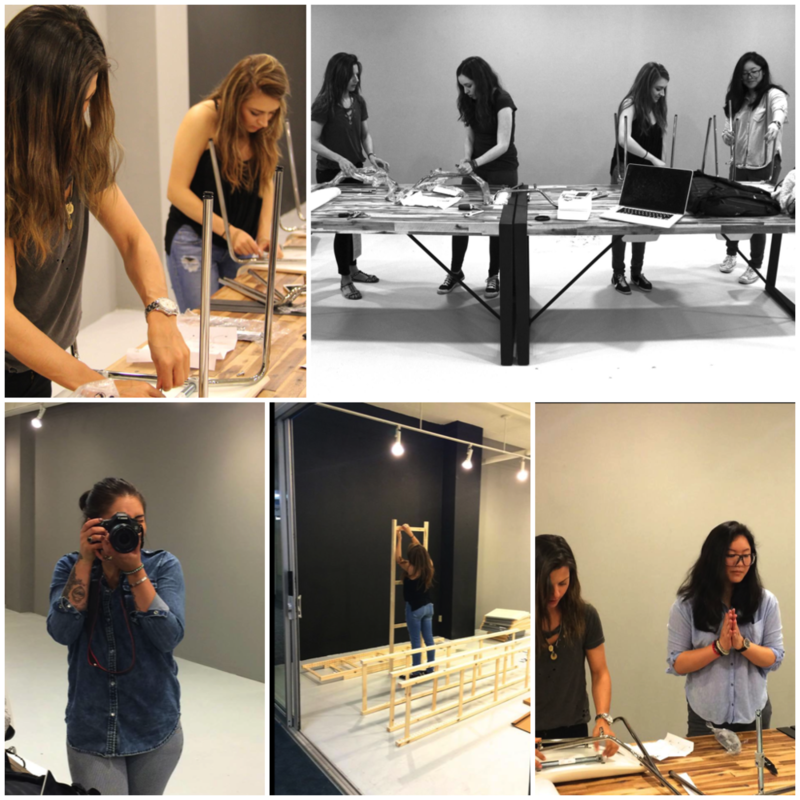 "It's a concept that deeply resonates with me with EJH Brand and is a trait that instantly bonds so many young entrepreneurs as we journey through the startup world." Her passion for art and the fact that she already invested so much time sketching for fun, led her to the prospect for EJH Brand. "I thought it would be cool to do my own thing. I spend so much time creating my artwork," says Hendler. In 2010 she began to build her candle business, which quickly evolved into a larger line of giftable goods including pillows, stationery and limited edition prints, all themed around her crisp, black-and-white illustrations and all constructed of premium, environmentally responsible materials. We met up with Hendler at her cool Marina del Rey home/ workspace at the edge of the canal on Washington Blvd. She fluffed a chimp pillow resting on a chair by the patio and said that the covers are all made of hemp and organic cotton, and overstuffed with down alternative for a plush form that will keep its shape over time. And the thick card stock of her stationery is composed of recycled and leftover fiber, readily available in Downtown LA's fashion district – the site of her just-debuted EJH Brand Showroom. Although EJH Brand's story may appear to be an overnight success, Hendler will quickly remind you that she started her company in 2010, but did not sell anything for two years, and throughout that time, and still to this day, she's hustling to generate new business, to establish smart partnerships and to participate in as many events and opportunities as possible to get her name out there. It's impressive but no surprise that Hendler is doing exactly what she envisioned. 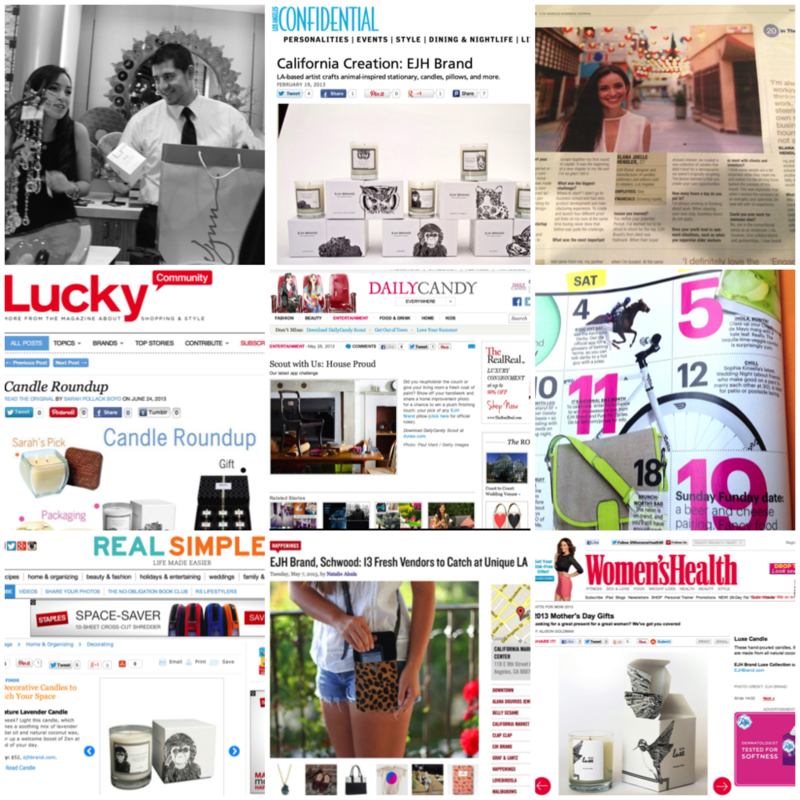 She's the fresh face of eco luxe and her giftable goods have already made appearances in PopSugar, Daily Candy, Women’s Health, Men’s Journal, Self Magazine, Los Angeles Confidential, California Home + Design, Technorati, and others. And her growing client base includes Hallmark, Gilt Groupe, the Wynn Las Vegas and Encore Resorts ... and of course, the Lincoln & Rose Marketplace. Elana Joelle Hendler is a featured maker in the Lincoln & Rose Marketplace, a curated collection of the best handmade goods in Venice. Treat yourself or someone you love to one of her natural coconut-wax candles featuring bright, fresh scents and original illustrations. Shop EJH Brand. EJH Brand's "Cool Peony" candle is also a featured item in the limited edition Mother's Day gift bag! Send mom a bundle of locally-made goods, delivered in a Lincoln & Rose tote.